Grange – Keswick Launch Co. The little village of Grange offers a great pit stop for refreshments and lunch. 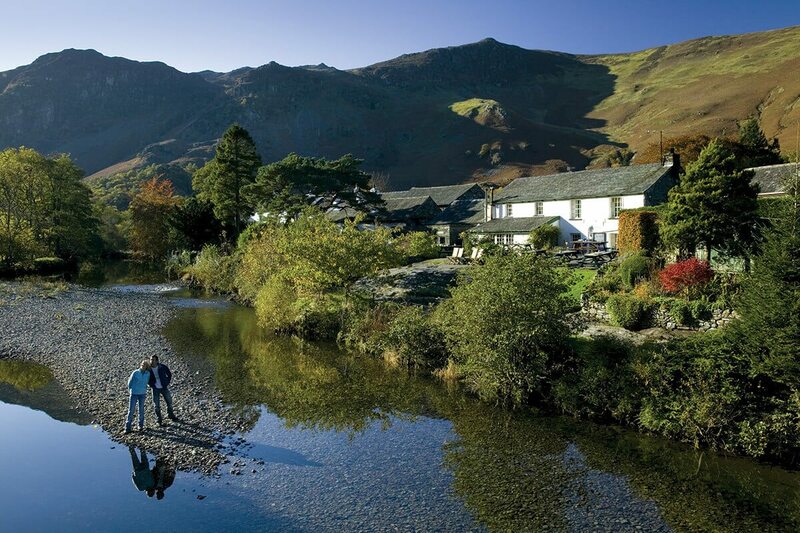 The village of Grange is situated at the entrance to the ‘Jaws of Borrowdale‘, where the valley squeezes between Grange Fell and Castle Crag. The impressive double-arched bridge over the River Derwent was built in 1675, but the hamlet’s origins are much earlier; in medieval times the monks of Furness Abbey, owner of this part of the valley, built an outlying farm, or grange, here. Mining spoil heaps from the sixteenth century are still visible at Brandlehow Bay. The locally known Chinese Bridge spans the river Derwent, a popular place for swimming. A sculpture to celebrate the birth of The National Trust in the Lake District.